"You were the last person I expected to fall down on the job, Trubshaw." Here's another rejected cartoon for you. I liked this gag, but perhaps the reference to the Weebles toys was lost on anyone who wasn't brought up in the 1970s like me. Click the link for more Not Yet Sold cartoons. This gag has actually been given an airing, albeit in a non-earning fashion, as it appears in the latest edition of the Foghorn, the magazine of the Professional Cartoonists' Organisation. You can read an archive of the Foghorn online, just click the button on the right-hand column of this blog (scroll down). To buy a print subscription to the mag, which comes out six times a year, go here. 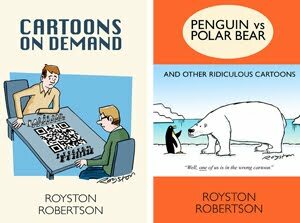 I like this one, Royston. As a child of the 1980s, I got it immediately - I remember we had a whole Weeble play park when I was little. But then I suppose most editors you've sent it to are older than both of us! Nice use of colour too. Is that right, Tim? In that case I think I owe him a fair bit already. Royston - cash or cheque? Are there any Liddle Kiddles cartoons out there I wonder? I initially thought of it as a quick way of highlighting key parts of my cartoons to get the point across, thinking I'd colour the whole thing if a magazine wants to buy the gag. But they often want to stick with the spot colour. Suits me, it saves time! Mike, I'm not sure *I* get that reference! I don't know if Liddle Kiddles made it over here. I do the same - sometimes to draw attention to a particular detail, and sometimes just to brighten an on-spec cartoon without going to too much effort in advance of acceptance. Not sure where I first saw it, but Ed McLachlan springs to mind as someone who uses it a fair bit. Either way, I'll buy you that beer, hopefully sometime soon! Ahhh i remember Weebles ...The late John Witt used to say on my return from the Irish cartoon festivals in Rathdrum and Skibbereen, years ago that i came home shaped like a weeble stinking of Guinness. During our Guiness fest this Weeble wobbled ,but he did fall down...often! 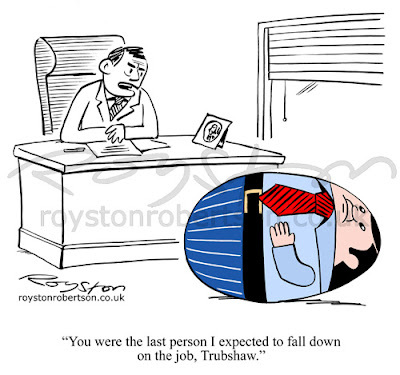 Rob, Trubshaw is just one of those great cartoony names, isn't it? Although it is a real name unlike, say, Bloggs. I agree that using the surname is a bit old-fashioned, but it's kind of a cartooning tradition, I suppose. But I do wonder if that was part of the reason it didn't sell. Having said that, I did send out a version where I changed the name to Frank at one point, and that didn't sell either! I reinstated the Trubshaw for Foghorn as it's a cartooning magazine. Tim, I think drunken Weebles might make another cartoon! I sometimes use the surnames of people I work with.